INFJs are one of the most talked about and written about personality types on the internet. They’re supposed to make up a mere 1% of the population, but if you run a survey in most groups, the majority of the people there will have been typed as INFJ. It gets even more confusing when you read articles about INFJs. If you look through a variety of online articles about INFJs, you’ll see that we’re basically a combination of every other personality type! We’re ISFJs, INFPs, INFJs, ISFPs, ESFJs, and INTJs all in one. Why does this happen so much? I had a sneaking suspicion as to why, but I decided to experiment.. I asked an ESTJ, two ESFJs, two ISFJs, an INFP, two ISFPs, and two ENTPs to take two popular free online tests. I didn’t tell them why I wanted them to do this, just that I wanted to see if they got the same result as they did through the official MBTI®. They all got an INFJ result, except for one of the ENTPs who got an ENFP result. These slapped together online indicators are creating an abundance of mistyped people who are then writing about the INFJ type as if it’s an ISFJ/INFP/ISFP/ENTP type. Now you might be thinking, “oh, I see…so you think you’re the only INFJ, right? What makes you so special?”. So here’s the thing..I’m not going to write anecdotal information about myself in this article. My personal life and story may not resonate with every INFJ out there. I’m going to use information from Carl Jung, Isabel Briggs-Myers, and other typologists who’ve put in a lot of study and time to clarify the different types. Hopefully this article can reduce some misconceptions. So without further ado, let’s get started! One thing that seems to be largely ignored in the personality community is that INFJs are intuitives first; feelers second. INFJs aren’t particularly focused on inhabiting or analyzing their own internal emotional states. They are more focused on analyzing the big picture, the future, and how one thing will lead to another. When it comes to their own emotions, they can be a little confused about them because they use Fe and not Fi. They are much better at picking up on other people’s emotions than their own. Generally speaking, the majority of INFJ’s would rather be reading books on philosophy or trying to imagine some far-off goal for the future than dwelling on their feelings or values. Blogger Heidi Priebe describes it well when she says, “Because so many IxFP types misidentify as INFJs, INFJs often develop a reputation for being incredibly emotional dreamers – when in reality, they’re much more intellectual and discerning than they are emotional and imaginative.” See more of Heidi’s article here. Can INFJs be emotional and sensitive? Yes. All types can be, but it’s generally not their main focus. Their main focus is nearly always going to be intuition and using that with feeling as a support process. I see a lot of INFJ memes and articles that talk about how they are so detail conscious. They “see everything”. They have to have their houses neatly in order and they notice every little thing that is out of place. I have to respectfully disagree there. INFJs are usually very unaware of the concrete details of their environment. Because INFJs have inferior sensing they usually gloss over details unless they pertain to people or the big picture. INFJs take in an overall impression of the atmosphere around them, but can be very blind to the details of their environment. While auxiliary Fe does allow INFJs to engage socially with a certain adaptability and awareness, they definitely need a lot of alone time so they can allow their Ni to process and synthesize the information they’ve picked up throughout the day. INFJs are masters of pattern-recognition and can easily be misconstrued as having some kind of “magical” foresight. The truth is much more technical. INFJs gather copious amounts of information via their inferior function (Se). They don’t instantly react to or identify this information like the Se-dominant type would, but they collect all this sensory data in a jumble in their mind. Ni works to synthesize this information, along with existing subconscious information, as if it’s assembling a puzzle or finding a way through a maze to a hidden insight. The INFJ then gets a “hunch” or revelation about what is happening and how things may unfold. They can easily sense “the brewing storm”, but it’s because they are constantly running this intuitive process in their mind, piecing together clues. That sensory data is vital, though, and without Se, INFJs would be unable to get their accurate perceptions. It’s not magic, it’s just pattern analysis and a semi-unconscious investigative guesswork. No….no, no, no, no, no. This is why people call us “special snowflakes” and find articles about us annoying and superior. We may be able to pick up on patterns in human behavior, and we might be able to tell you (if you ask) which steps could lead in different directions. This doesn’t mean we know your entire past, your history, your experiences, what’s made you who you are. We may be able to understand your emotional state before you blatantly spell it out, but that doesn’t mean we’re all empaths. To say something as incredibly arrogant as “I know you better than you know yourself” is insulting and belittling and certainly not kind or intelligent. We’re not all-knowing wizards. We’d all like to be, but truthfully most of us come across as pretty normal people. We can be duped. We can be wrong. We can be lied to and believe it. We’re not superior/better/more special than anyone else. The INFJ personality type is unique and wonderful in so many ways. But so are all fifteen other personality types. I hope this article has cleared up some of the misconceptions…what do you think? Let me know your thoughts in the comments! You can also learn A LOT more about the INFJ personality type with this INFJ starter kit and course from Personality Hacker. Like this article? Then you’ll enjoy these! I feel that this article is purely biased because you want to define what an INFJ personality should be and is. If these “misconceptions” are not true, then why do most of the explanations explain my character or persona to a tee? Guess I have a mental issue to look after then…Also i took the MBTI in college. I have not met another being who feels the same way as I do, having the characteristics of an INFJ. So it is kind of a weird statement to make that they are everywhere because I never had anyone share the same viewpoints as i do about the true issues of our society. I hope to provide some useful insight if I can. 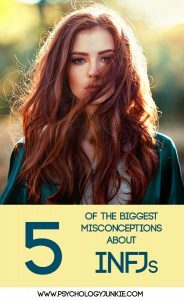 “If these “misconceptions” are not true, then why do most of the explanations explain my character or persona to a tee?” – If the misconceptions about the INFJ are what explains your character, you are probably mistyped. Also, just because the author wants to define what an INFJ personality should be and is, doesn’t mean they are biased; the entire mission statement of MBTI is to define and categorize personality so as to better understand other people. Finally, INFJs have auxiliary Fe, so when you say, “I never had anyone share the same viewpoints as I do about the true issues of our society,” It doesn’t really strike me as an INFJ. If anything, you should share some, most or (rarely) even all viewpoints with ENFJs and other MBTI types with similar functions. INFJs feel pretty misunderstood generally, yes, but having NEVER met another person like you? It seems to me like you got caught up on the fact that INFJs are the “rarest” personality (not that that matters or means anything at all – technically, 1.5 of every 100 you met will be INFJ) and stuck to the mistype because that sounded right to you. I’m not saying you’re not a unique individual, just to be clear, I’m just hoping that’s not what you’re basing your typing off of. You say you took the MBTI test in college, but it is VERY VERY easy to mistype as INFJ. Anyways, if the misconceptions here explain your character let’s look in to some possible typing. Emotionally sensitive and intense? That smells like Fi all over. I’d suggest looking into INFPs, who commonly mistype as INFJs, or ISFPs, which is also possible because they’re tertiary Ni may resemble the INFJs primary. Being detail oriented? That’s an Si trait. Look at ESxJs and ISxJs. Although I’m guessing since you tested INFJ you can cross the ESxJs off the list. Ambiverted? Honestly that one could be any type. Introverted or Extraverted isn’t necessarily how the person acts in public or whether they value time with other people, but from where they draw their energy. A true Introvert draws energy by being alone to recharge. Psychic/good at reading people is just an exaggerated term for the INFJs Ni/Se processing mixed with the Fe to use it on other people. This however doesn’t mean INFJs are the only ones good at reading people. Any developed, strong Fi/Fe user should have a good thermometer of other’s emotions and intentions. I’ve grown up and worked through many of my insecurities since then, to my great relief! One of things outside of myself that’s made a difference is the impact of blog-writing people like you. I’m particularly glad to see how you write about Extraverts and Sensors. There seems to be so much dismissiveness and stereotyping about those preferences on personality-focussed websites, and I think that is at least part of the reason so many people end up mistyped. Who wants to be someone uninteresting or second rate? Thank you!!! This is spot on. This article was spot on. I appreciate the truth written in theses misconceptions. I am an INFJ. And I thank you for clarifying to other that we’re not all knowing mystics and we can get it wrong. Just because I know things doesn’t mean I know everything. There’s only ONE who does. Again thank you for the clarification.